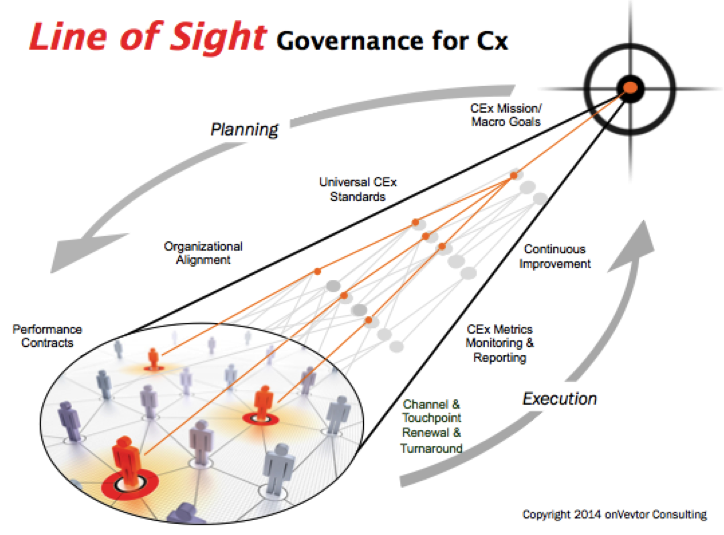 In our view, good Cx governance, at its most basic level, is about establishing a clear “Line of Sight” between your strategy and the desired outcomes of your program, with clear linkages to all the moving parts and initiatives that comprise it. This involves clearly defining strategy and desired outcomes, aligning stakeholders, defining accountabilities, and establishing internal commitments. It involves putting in place a process that translates your goals, values and standards into an efficient and repeatable process for assessing and renewing your customer channels and touchpoints. And, most importantly, it includes closed-loop reporting and monitoring to manage the pipeline of ongoing improvements that emerge, and ultimately lock in the expected benefits and ROI.